West Mersea BBQ, Saturday, 28 July - Murmurings from the North Sea! 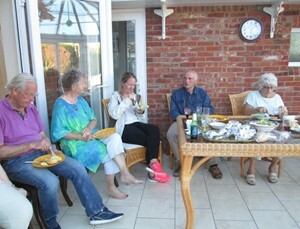 Vivien Ryser, our longtime Treasurer invites the East Coasters each year to a swimming Barbeque at her home, Alfa House in West Mersea. After almost four months of benign, indeed 'Mediterranean' weather it was a chance for the North Sea to send a reminder! With perhaps a touch of complacency Jacqui-B set off at 0600 on Saturday. Well winds up to 35 knots on the nose said it all. Also in that languid sunny moment drying off from our swim the previous day Gale had clearly omitted to secure one of the clips on the Helmsman's Seat properly which went AWOL with a fender amidst a sea of white horses. Despite a search pattern worthy of an Ocean Minesweeper we only recovered the consolation prize - the fender. Arriving in West Mersea the deeply embedded tradition (of all of four months) had lots of people in bikinis on the foreshore - all clutching anything that might move in the howling (albeit warm) breeze. When you are encrusted (possibly embalmed?) in salt the prospect of a swimming pool, barbeque, beer and wine is extremely piquant! Our expectations were met. Vivien, Val and Team had put on a wonderful spread and James Simpson and Terry Corner proved their cooking skills. The sun shined. Vivien has a lovely garden with classic statues of Aphrodite and Hebe. Remarkable what we learnt about them; they certainly didn't need salt encrusted clothes! The voyage back was in theory all downwind. On Sunday after a bit of assessment of a forecast SSW 6-7- and a rest - there was a bit of lull. Convinced that downwind with a reefed genoa was manageable we sailed with the prospect of a ripping good tide. Amazing what a fetch just from the Thames can do!. We donned safety lines, shut off the hatch and gritted our teeth, tearing up the Wallet hoping nothing would break. Cooney apparently was having a similar experience further North. We had been reminded, after six benign crossings of the North Sea that our little patch was back to its old self - and we should judge things accordingly. Our thanks to Vivien and Team for a splendid weekend. Alert issued for a second GPS Roll Over due to limitations in the 10 digit binary number store. The United Kingdom Maritime Coastguard Agency (MCA) and the United States Homeland .. Confirmation required for NL75 by 30 April 2019. NORMANDY Landings NL75, DDAY75 2019 – Confirmation of Interest Expressions of interest totalled 46 boats and 117 people have been ..
2019 Programme now Available Once again this year we have a combined programme RNSA and RCYC – we have many members in common and historically our most successful ventures have been ..
News artical in media 19th January 2019. Commemorations of the greatest seaborne invasion in history to liberate Europe. A Second World War flight display will be staged from IWM ..
Each year the East Coast Branch takes CURNU cadets on a weekend sail. The Michaelmas and Lent Terms are ideal because they aren't plagued by exams 7-9 December found two East Coast ..